The MyFit is a pretty good idea taken unexpectedly to the extreme. A workout player, sure, that's a good idea. But wait, this doesn't just count calories, it measures your fat and forcibly tells you to drink water. As the world's first portable media player to integrate wellness management tools, such as stress and body fat levels and customized workout guides, MyFit helps users achieve wellness while enjoying their favorite music tracks. MyFit transcends basic playback of music and videos and enters the realm of wellness information and monitoring. Its unique features reflect the functional and stylistic nature of music enthusiasts while incorporating important applications and information for a fully-customizable device that encourages a healthy lifestyle. Music can be collected into a jogging playlist and a simple Tapping Control Jogging mode makes it easy to change to the next song without interrupting a workout. Breaking ground with the world's first fat and stress sensors located on the top of the player, MyFit measures a user's wellness indicators and contains an exercise management program to keep people on target with their fitness goals. A built-in accelerometer automatically tracks calories burned while jogging, and users can record their caloric consumption per meal with the included food calorie database. Additional wellness applications built into the MyFit include a water intake manager and smoking cessation utility. 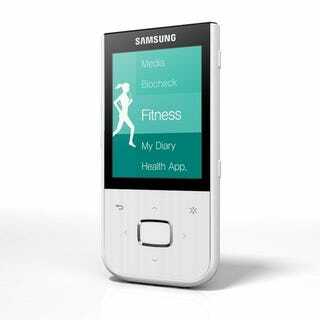 But more than helping to make consumers healthier, MyFit is a full-featured portable music player that features an FM radio tuner and Samsung's DNSe 3.0 sound enhancement technology, which helps to overcome the inefficiencies and limitations of compressed audio files and generate a more realistic stereo sound. Media playback includes high quality compressed and lossless audio formats, such as MP3, WMA, OGG, and AAC, as well as MPEG4 and WMV video formats.